Our Amish Hand Forged Buckingham Iron Table is not the faint-of-heart. 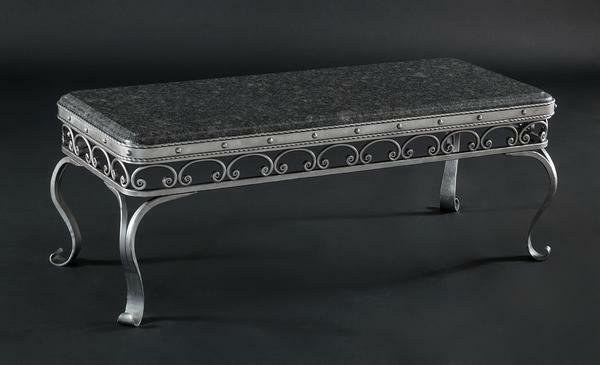 With metal scroll details creating a border under the top that can be custom-made from glass, wood, or granite, this coffee table will stand out any space with its medieval feel. We think the intricate design with scrolls formed out of a straight piece of iron that is heated and shaped by hand then stamped works well in a vintage-inspired, modern, or formal space. It could also work in an elegant industrial space. This design also includes rope details, grommets, and Queen Anne style legs. Under its curling feet you will find felt foot cushions as well as the shop's quality seal stamped on one of the legs. All pieces from this collection are engraved with the date the table was created adding to authenticity, showing it is one-of-a-kind, and making it an heirloom.